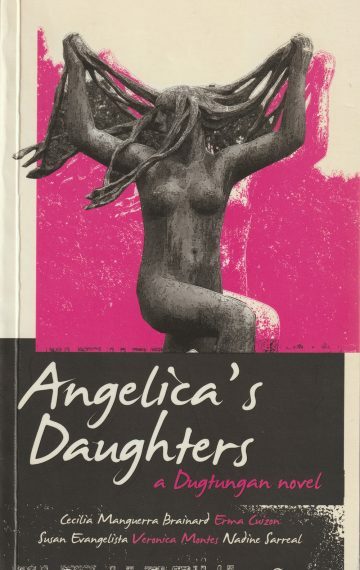 Angelica’s Daugh­ters is a dug­tun­gan or con­nect­ing nov­el writ­ten by five authors. The authors were inspired by this writ­ing tra­di­tion which was pop­u­lar in the Philip­pines in the 1920s. Each author wrote a chap­ter or part of the nov­el, then passed the work on to the next author. Test­ing to see if they could do this col­lab­o­ra­tive work, the authors did not set out to write a seri­ous nov­el, but some­thing fun. “Chick lit with a com­fort­able dose of smart­ness and his­tor­i­cal verve. Angelica’s Daugh­ters cel­e­brates auda­cious hero­ines primed by deep pas­sion and fairy­tale romance! Set in the heat of a 19th-cen­tu­ry Asian rev­o­lu­tion and what its set­ting becomes by the 21st Cen­tu­ry, Angelica’s Daugh­ters beguiles with its myth­ic splen­dor, threat of a gen­er­a­tional curse, mas­ter­ful betray­als, and female leads read­ers can fall in love with.